More than just a game, Valhalla Online was designed as a permanent repository for the uploaded minds of mortals afraid of death. An artificial afterlife. 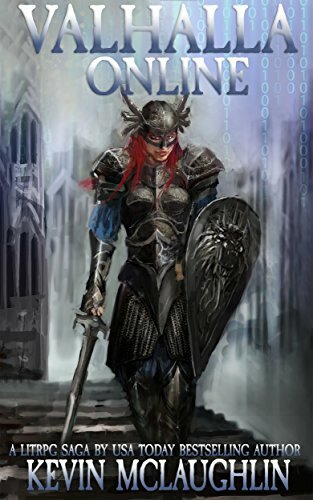 Samantha’s world is turned upside-down when she arrives in Valhalla – because as far as she knows, she isn’t like the other people uploaded there. She isn’t dead. At least…she hopes she isn’t. Now Sam must solve the mystery of her own abduction – or murder! – while trapped inside a virtual world, cut off from communication with the outside. To do this she must do more than simply survive Valhalla – she needs to win the game! The battle raged only a dozen feet ahead. Men with green bandanas tied to their arms, or with green paint on their shields, were holding a position on the wall facing off against a squad of blue-bearing troops. The bad news was that the green troops – whom Sam assumed were the enemy – had ladders up against the outside of the wall. More troops were climbing into the fort every moment. The good news was that most of them were facing the blue troops on the other side of the rampart. Their backs were to Harald and Sam. Harald didn’t pause for more than a moment to let his eyes adjust before rushing in. He gave a terrific scream, bashing the one green warrior with his shield as he was trying to climb onto the wall. The man lost his balance and fell backwards outside the fort. There was a long cry as he fell, which cut off suddenly. It sounded like the drop on the other side of the wall was at least as far as the one on this side. An arrow flashed upward from somewhere outside the fort. Acting entirely on instinct, Sam raised her shield just in time to ward the shot. It stuck into the wood with a resounding thunk. The impact stung her fingers and left them buzzing. How the hell had she found herself in this crazy situation?